Developed by the team behind Brothers a Tale of Two Sons, Hazelight studios brings a new title featuring co op mechanics that I have never seen in a game before, and it could not have been done any other way. 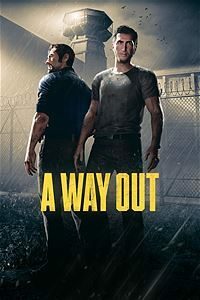 A Way Out tells the story of two different characters, Leo a short-tempered common criminal with a soft side when it comes to his family, and Vincent. The characters have been wrongly convicted by the same man, and end up in prison. About ten minutes into the game, Leo and Vincent start interacting with one another, realizing they are after the same person and want to escape for prison to get revenge. From this point on, we see Leo and Vincent work through numerous situations together in order to complete tasks to get out of prison. After the prison break, you find out why these characters are after the same person, you find out about the problems in their personal lives and together the characters try to fix the problems. Working together is essential in this game every situation you must be done together. I realized how much of a co op this game was very early on, the specific situation, when Leo and Vincent are taking the back of the cell toilet off the wall and using a chisel to break the wall so they can crawl through. While one character does this, the other character watches out for the guards passing by and distracting them. Throughout the course of the game, there will be different ways to do things. You have a choice of doing things Leo’s (aggressive) way or Vincent’s (calm and smooth). Throughout the adventure, you get to compete in little mini games with your co-op partner like a game of darts and baseball or arm wrestling. This is a great action-adventure indie title; there were times I was on the edge of my seat, like during the prison escape, the hospital escape & the motorcycle chase scene and the final twenty minutes of the game. I had a great time playing with my friend and co host even though I did not have a the full game I was able to play the trial version all the way through as long as he was playing as well. With that being said the game did have some issues, texture popping issues and some of the shooting mechanics; It should not take two or three head shots to kill an enemy. The game could have done without the shootouts at the end but it was a nice change of pace for the last half hour of the game. A Way Out is more than I expected in every aspect, from the story to the game play & character progression. It falls in a genre we do not see enough of now days (couch co-op). With some great unique game play mechanics this is a breath of fresh air with a bit of minor problems it is so fun; that you will want to go back and see what you can do differently. A Way Out is an enjoyable story driven game with a unique premise. You can play with a friend but only one person needs to own a copy of the game. You’re partnered with Leo or Vincent by chance. As you work together trying to escape from prison with your partner. Then running from the law as you try to find Harvey the person who got you both sent to prison. The story is told in segments with Leo and Vincent sitting in a plane reminiscing about their journey together up to that point. The players can choose which character they want to play as. Although I did not find it made a huge difference in the outcome of the game. The game is all about choices and working together, however after going back and changing my decisions on a few key choices. I found it changed a few cut-scenes and not the rest of how the game played out. Reviewed by Samurai at Gamers of the Round Table.